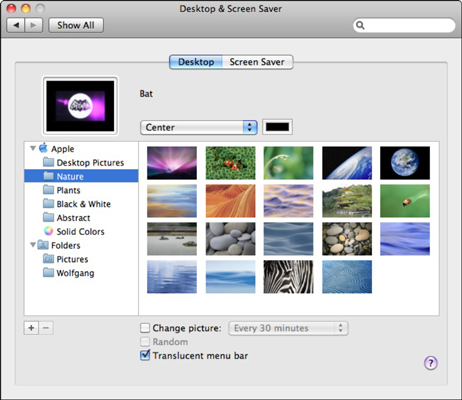 Snow Leopard lets you personalize just about anything you can imagine on your Mac, including your desktop and screensaver. You access this group of settings by clicking the System Preferences icon on the Dock and choose Desktop & Screen Saver. Current Desktop Picture: You can click a picture in the thumbnail list at the right half of the screen to use it as your Desktop background. The Desktop is immediately updated, and the thumbnail appears in the well. To display a different image collection or open a folder of your own images, click the Add Folder button at the lower left of the window (which carries a plus sign) and browse for your heart’s desire; click Choose to select a folder and display the images it contains. Layout: You can tile your background image, center it, fill the screen with it, and stretch it to fill the screen. (Note that filling the screen may distort the image.) The layout control appears only when you’re using your own pictures, so you won’t see it if you’re using a Desktop image supplied by Apple. Change Picture: Select this check box to change the Desktop background automatically after the delay period that you set, including each time you log in and each time your Mac wakes up from sleep mode. Random Order: To display screens randomly, enable the Random Order check box. Otherwise, the backgrounds are displayed in the sequence in which they appear in the thumbnail strip. Translucent Menu Bar: When enabled, this feature turns your Finder and application menu bars semi-opaque, allowing them to blend in somewhat with your Desktop background. If you’d rather have a solid-color menu bar, deselect this check box. Start Screen Saver: Click and drag the slider here to specify the period of inactivity that triggers the screen saver. To disable the screen saver, choose the Never setting at the far right of the slider. Use Random Screen Saver: Just what it says: If this check box is enabled, a different screen saver module is used each time the screen saver is activated. 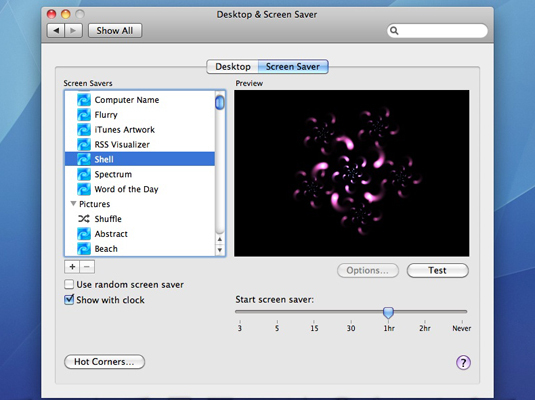 Show with Clock: If you want your selected screen saver to display the time as well, click this check box to enable it. Hot Corners: Click any of the four pop-up menus at the four corners of the screen to specify that corner as an activation hot corner (which immediately activates the screen saver) or as a disabling hot corner (which prevents the screen saver from activating). As long as the mouse pointer stays in the disabling hot corner, the screen saver doesn’t kick in no matter how long a period of inactivity passes. Note that you can also set the Exposé activation corners from here.